Wow, two posts in a row about Ballast Point Brewing Co., but the beer news just keeps flowing. Tomorrow, Thursday July 29th, Ballast Point will be debuting their newest beer, San Salvador Saison at their Scripps Ranch tasting room (10051 Old Grove Rd., San Diego, CA). I’ve been on a big saison kick recently and am really excited to try this. The always tasty MIHO Gastrotruck will be outside Ballast Point starting at 4:30pm with some food to pair with the beer. And if you can’t make it up to Ballast Point don’t worry, The Linkery (which helped secure some of the ingredients and brew the beer) will have a keg of San Salvador Saison tapped Thursday evening as well. 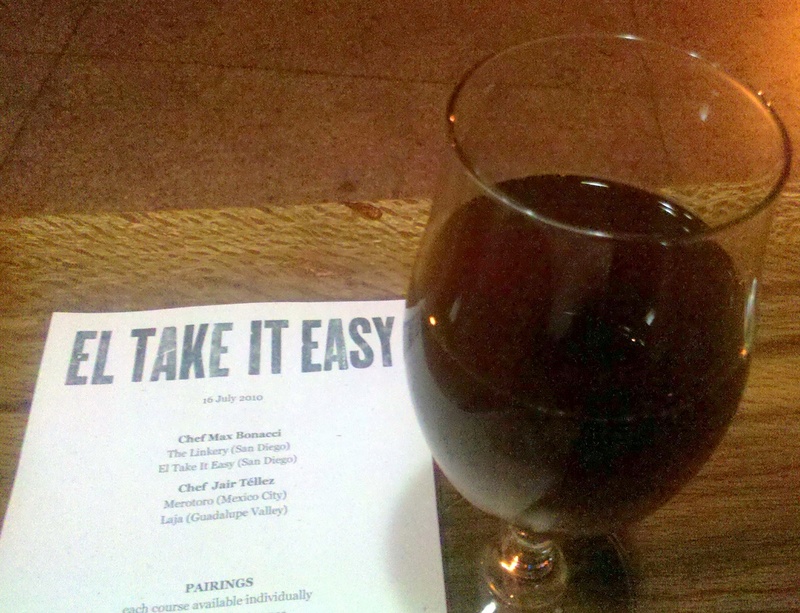 The idea started as a San Diego Farmhouse Ale using local ingredients. We wondered what the Kumeyaay Indian’s were eating when Juan Rodriguez Cabrillo climbed out of his flagship boat, the San Salvador, and onto the shore of Ballast Point in 1542. Also, what might have Cabrillo stocked on his boat before he left Acapulco (then called Navidad) 3 1/2 months earlier? So with some research we tracked down a fun mix of ingredients for a Belgian inspired San Diego indigenous Ale. With some help from our friends at The Linkery, North Park Native Plants and Wingshadow’s Farm we were able to track down ingredients like corn, pine nuts, agave, elder flower, white sage, manzanita berries, curacao and local sage honey. The malt bill consisted of Belgian pale malt, caramunich, biscuit, wheat and corn. The result is a 7.5% ABV, brown beer that really has to be tasted to be understood. It tastes like the San Diego countryside. MIHO Gastrotruck uses fresh, local, thoughtfully sourced ingredients to create hand crafted steet food that is affordable, convienient and delicious. We could think of no one better to come up with the perfect food pairing for this special brew. You can check them out at www.mihogastrotruck.com. Juan and his pals have come up with a Vande Rose pork belly braised in San Salvador Saison and served with an agave glaze and corn fritters. They will be here starting at 4:30pm tomorrow serving this dish along with some of the other specialties that have made them the talk of the town. Stop by for food and beer done with real LOCAL flavor. See you here! Yesterday, Ballast Point Brewing Co. posted a nearly final design of the new six pack holder for their wildly popular Sculpin India Pale Ale on their Facebook Page. Sculpin is a 7% ABV IPA with a big hop kick, Ballast Point has been brewing it off and on for a few years with it becoming more generally available and packaged in 22oz bombers within the last couple of years. Judging by the comments on their Facebook page, many people are excited for Sculpin in six packs, but others are worried about the cost. Ballast Point says the six packs of 12oz bottles should retail for $14.99 in most markets, which is a bit pricey for a six pack, but a great deal compared to buying 22oz bottles which retail for about $7.99. 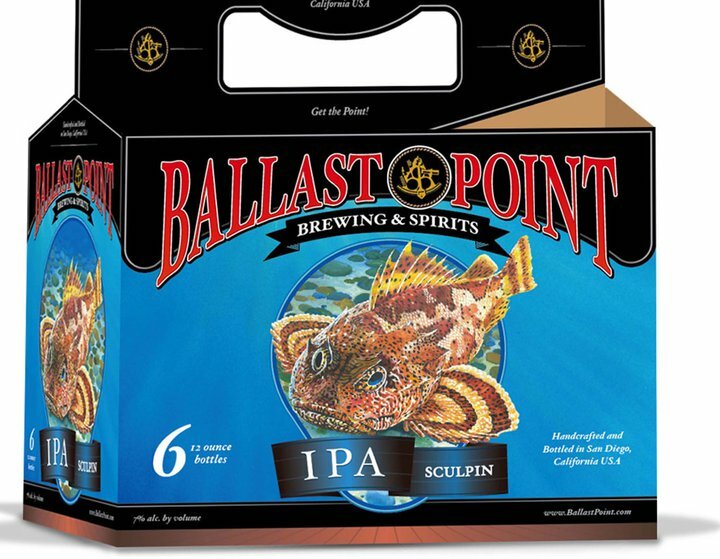 If Ballast Point sticks with that price point a six pack of Sculpin will be about 21 cents per ounce, compared to about 36 cents per ounce for a 22oz bomber. But I’m not so sure that will matter much to many consumers, there’s something psychological about the higher price of the six pack that might scare away many beer purchasers. Personally I’m excited (as I think many others are) for the 12oz six packs of Sculpin, no word on when they’ll hit the shelves, but we hope it will be soon. The question of what to do with spent grains left over from the brewing process can be a big concern of breweries. Many breweries contract with ranchers who then feed the grains to livestock, but homebrewers face the same dilemna only on a smaller scale. Most homebrewers have far too little grain to be worthwhile to ranchers, but at the same time they don’t want to be wasteful and just throw out their spent grains. I’ve known some homebrewers who have baked crackers, but according to their accounts the crackers never turned out very well. One local homebrewer has found a solution to this problem: turn the spent grains into dog treats, that’s what Doggie Beer Bones is all about. 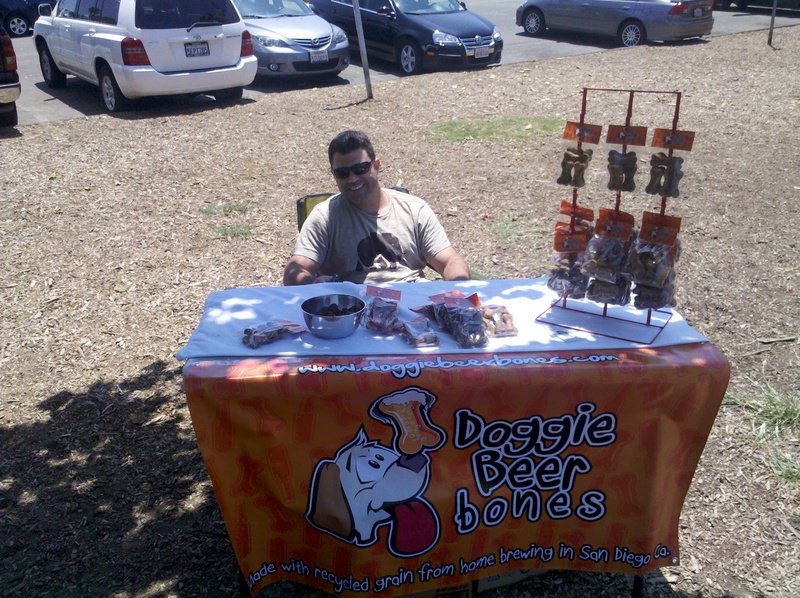 I ran into David Crane the guy behind Doggie Beer Bones this weekend outside the Grape Street Dog Park where he was set up in the shade with free samples and treats for sale. Doggie Beer Bones are made from grains after the mash, which means the grains haven’t touched any hops (this is important because hops are poisonous to dogs) and obviously have no alcohol either. The ingredients listed are: “malt, barley, oats, peanut butter, flour, egg and water”, basically the standard ingredients in most vegetarian dog treats. A package of six medium sized treats will set you back $4 and 12 treats cost $7. All the dogs that got free samples seemed to like them, and I bought a pack and my dog hasn’t hesitated to gobble them up. Check out the Doggie Beer Bones website for more info, or follow them on Twitter @doggiebeerbones to see where and when they’ll be around San Diego. Posted by Jeff Hammett in beer festivals, Cucapá, events, stone brewing co.
UPDATE 3: New dates have been set, Tijuana Beer Fest is scheduled to happen October 8th and 9th. UPDATE 2: According to Cucapá’s Twitter account, the festival has been postponed until October. UPDATE: According to Brewery Rowe blogger Peter Rowe, the 2010 TJ Beer Fest has been delayed again. Rumor has it the new date will be September 17th and 18th 2010. I’ll post more information as it becomes available. Getting event details and confirmation for events south of the border can be excruciatingly hard. Dates change and emails and phone calls go unreturned, leaving one to wonder if the event is happening at all. After a few false starts it appears as if the 6th annual TJ Beer Fest is happening this year after all. The TJ (Tijuana) Beer Fest will be happening Friday August 13th and Saturday August 14th, 2010 on Avenida Revolucion between 1st and 3rd in downtown Tijuana just minutes from the border. Details are sparse, no word on the time of the event (but based on last year I expect it to be at night on Friday and starting in the afternoon and stretching into the night on Saturday. Cost is up in the air, but expect it to be cheaper than similar festivals north of the border). Cerveza Tijuana and Stone Brewing Co. appear to be the primary sponsors of the event, so expect them to be pouring beer. According to the flier the festival will feature over 100 craft beers. 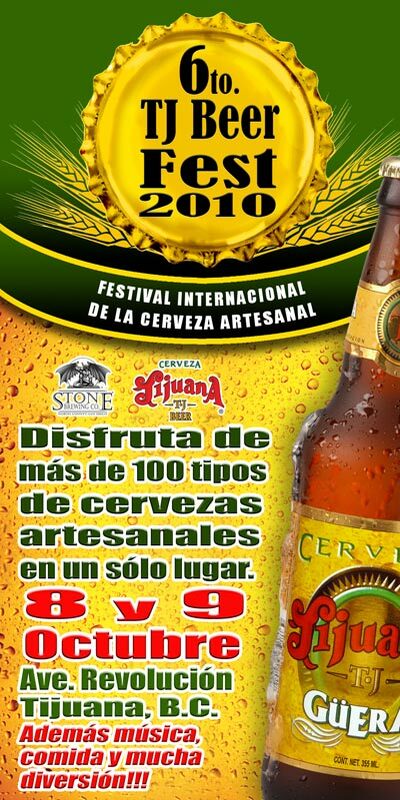 Emails to both Stone and Cerveza Tijuana asking for more detail about the festival have not been returned. I was able to confirm with Mario Garcia of Cucapá that they will be on hand at the festival. He says they’ll be pouring their new Runaway IPA and possibly Lowrider Rye Ale if time permits. I don’t know what other breweries to expect at the festival, last year’s festival brought mostly breweries from California and Baja California, with a few others from farther off. Check back for more details as the festival nears, or just show up and be surprised. Posted by Jeff Hammett in events, manzanita brewing co.
It’s not often that I get to blog about the openings of two new breweries during the same week, but that’s happened this week. Wednesday saw the opening of Hess Brewing Company (click here for my post about it) and tomorrow marks the grand opening of Manzanita Brewing Company in Santee. A day before their grand opening they had four beers on tap, with a fifth in the bright tank awaiting carbonation, hopefully ready in time for today’s festivities. I sampled a Blonde, Pale Ale, Brown Ale and an IPA, while their Red Ale was being prepped for tasting tomorrow. Head Brewer Garry Pitman gave me a tour and overview of the brewing operations while I sampled the beer. Manzanita Brewing Co. brewed their first batch of beer a little over a month ago, but he’s been homebrewing for about five years. They brew on a 3 barrel system while doing as much as possible to conserve and reuse water. The tasting room is small, only three or four stools and a small counter, while I was there a couple other people stopped in and there were about 4 people working, we all ended up in the back of the building, in the brewing area chatting and sampling beer. As for the beers, the Blonde, Pale and Brown were good. The IPA, 7.6% ABV, wasn’t a bad beer, but it seemed like there was something off about it. The Blonde, 5.5% ABV, a Kolsch was fairly light and citrusy, a good beer for a warm day. The Pale Ale, 6.3% ABV, had a good hop presence but wasn’t overpowering while the Brown Ale at 7.4% ABV could possibly be described as an Imperial Brown. I’m told they’ll have four year round beers, I’m not sure which one out of the five they have on now is not in the regular line up, and will have seasonals throughout the year. Pitman told me he’s hoping to brew a pumpkin beer as a fall seasonal, and would like to do one seasonal beer per month. They offered five tasters for $5, and $7 would get you a Manzanita Brewing Co. pint glass full of beer, which can be brought back for $5 fills. Growlers and kegs are available also, but I didn’t get pricing on those. Manzanita has big plans, now that they’re off the ground and have some beer in kegs they’re planning to start bottling some beer soon, as well as starting to look for some draft accounts in local bars and restaurants. One concern that did come up while chatting was heat, Manzanita Brewing Co. is located in a non-climate controlled warehouse in Santee, which can get extremely hot during the summer months, which could be bad for the beer as it is fermenting. Pittman assured us that they’re prepared for that with a glycol cooling system and they’re prepared to use an internal cooling system as well as a backup if necessary. 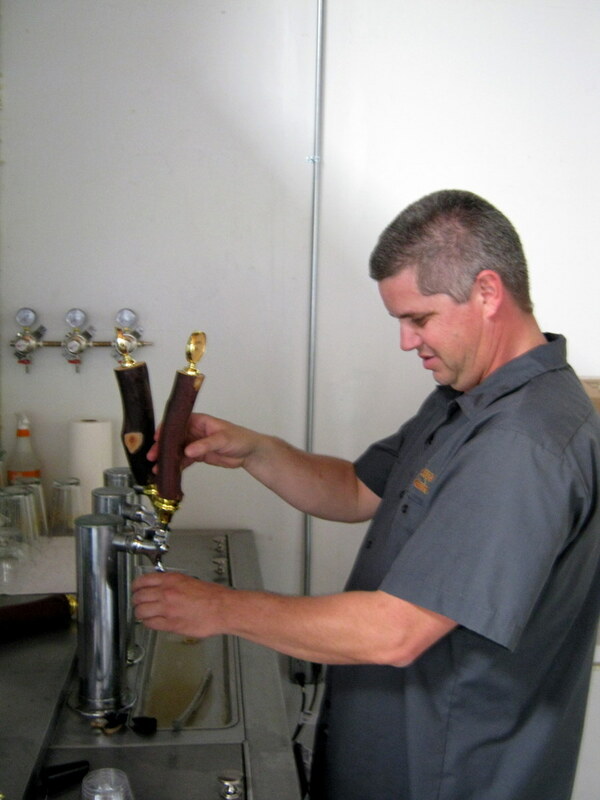 Manzanita Brewing Company’s grand opening is happening today (July 10th, 2010) from Noon to 6pm with music from Soul of the River and food from Pinnacle Peak Steakhouse. They’re located at 9962 Prospect Ave., Suite E. Santee, CA 92071. More information can also be found on their Facebook Page. Click through for more pictures from Manzanita Brewing Co.
Posted by Jeff Hammett in events, hess brewing co.
Hess Brewing Company opened their doors yesterday (July 7th, 2010) to become San Diego’s newest brewery, and according to their website San Diego’s first licensed nano-brewery. I can’t find a definative definition of nano-brewery, but as the name suggests, it’s a small brewery, even smaller than a “micro-brewery”. 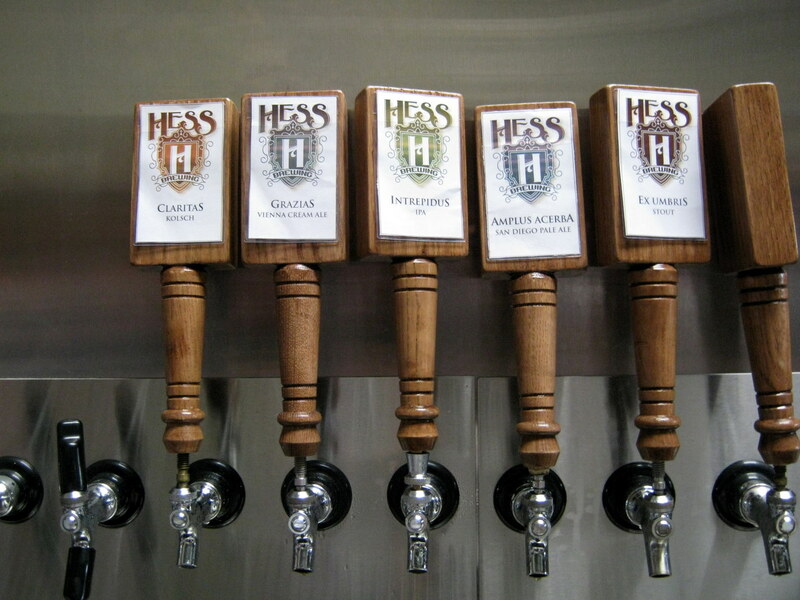 Hess Brewing Co. brews on a 1.6 barrel system, which means each batch of beer they brew is only 51 gallons. (By comparison, according to their website, Stone Brewing Co. has a 120 barrel brewing system, which comes to about 3720 gallons). Hess Brewing Co. is located at 7955 Silverton #1201 in San Diego, just off Miramar Rd. (not far from Alesmith Brewing Co.). Their small warehouse space serves as both brewery and tasting room, brewing supplies and ingredients line the walls, the brewing system is off to one side and if you look carefully you can see a fermenter in a corner. Founder Mike Hess tells me he’s been homebrewing for about 15 years and has worked his way up from brewing on 5 gallon, to 10 and 20 gallon systems and now to Hess’s 50 gallon system. With a solid lineup of five beers, ranging from a fairly light Kolsch to a high ABV Imperial IPA (also known as a “San Diego Pale Ale”) and a few other styles in between Hess has a good lineup. At the opening all five beers were available to sample, $10 got you 4oz samples of each, plus a half liter Hess Brewing Co. glass to take home. Each beer is also available individually, by the pint or in a growler to go. With only about 4oz of each, it’s hard to fully judge each beer, but they were all good and the Claritas Kolsch and Amplus Acerba San Diego Pale Ale were my two favorite. None of the five beers tasted nearly as strong as their listed alcohol content would suggest. The Amplus Acerba San Diego Pale Ale was especially easy drinking for being 11.3% ABV. I look forward to trying each of these again, in a larger amount to get a better taste of each. As of right now the only place to get Hess Brewing Co.’s beer is at their tasting room. I’m told they might look to get some draft accounts at area beer bars in the future, but have nothing solid lined up yet. If yesterday’s crowds (and how good the beer tasted) are any indication Hess Brewing Co. is sure to be a hit. Mike Hess told me that people started showing up right after the doors opened at 2pm. I was there for about an hour later in the evening and it was packed the entire time. Check out some more pictures from Hess Brewing Co. below. 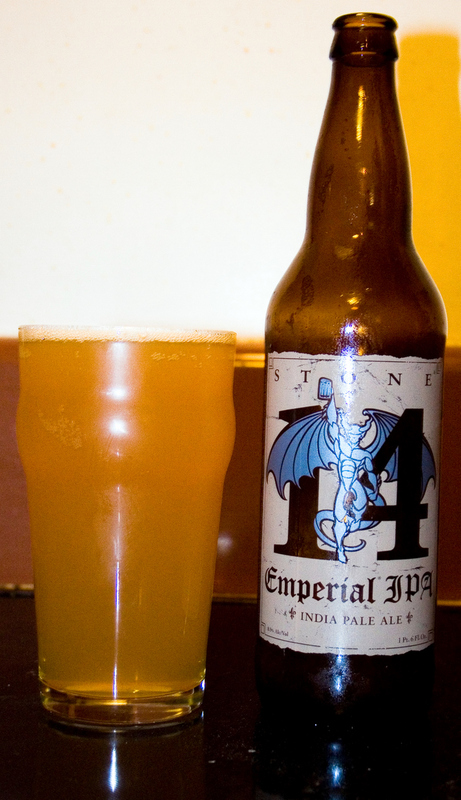 Posted by Jeff Hammett in beer reviews, stone brewing co.
I’m sad to say it, but this is the second year in a row that Stone Brewing Co.’s Anniversary Ale just isn’t the beer for me. Double IPAs aren’t my favorite type of beer, but they’re far from my least favorite; the same goes for British IPAs, of which this beer is both. Saying I didn’t enjoy this beer would be an exaggeration, I probably won’t be drinking any more of this year’s Anniversary Ale. The beer poured a hazy orange with very little (practically no) head. The little head that was there disappeared after the firs sip. This may have been a shoddy pour on my part, I’m not sure what happened. I expected more of a head from this beer. I could smell some citrus hops in the aroma but it’s not overpoweringly hoppy. I also smell some malts, like the smell of fresh biscuits. The hops come out and are very forward in the taste, the taste is far hoppier than the smell let on. It tastes like a British IPA, only far hoppier and more aggressive. I don’t get much of the malt flavors I could smell. I’m not a big fan of British IPAs (or even most British Pale Ales), I’ll drink them, but they’re not my favorite. And that’s pretty much how I feel about this beer. It’s not bad, definitely not like anything I’ve had before. This is exactly what I would imagine a typical British IPA would taste like given the “Imperial” treatment. While I might not be drinking this beer too often, I do recommend you try it. It might not be for me, but I imagine it would be greatly enjoyed by fans of British hops and all around hopheads alike.